If you follow me on Twitter, you’ve been inundated with tweets about the Manti Te’o story. Apologies to those who haven’t taken as big of an interest in this story as I have. I must say, the past two days have featured the most gripping, bizarre series of events I have ever experienced. I have never seen a single story dropped from one source cause such a shock wave throughout the interwebs. And not just nationwide, either—we’re talking worldwide. Pretty fascinating stuff. Pieces to the Te’o puzzle have been popping up so fast, I’ve have a hard time keeping up. But that’s what makes the story so compelling. Deadspin lit the fuse, and the whole thing just exploded. I wanted to start from the beginning and trace exactly how the story unfolded. Maybe you’ve already read every link/tweet I’m about to list. That’s fine. If anything, this is a personal exercise for me to take a look back and re-live the story. At a maximum, it’s your guide to get yourself caught up on anything you may have missed. I’ll obviously start with the original Deadspin post. I’m not even going to bother giving a fluffy intro to this masterpiece. I suspect many people have not even read it, but instead gathered the gist of the story through tweets and reactions of others around the web and on the news. Even if you know every facet of the story, go back and read it. It’s packed with extremely interesting details. With the benefit of hindsight, it’s pretty amazing how dead-on they were, now that several pieces of the puzzle are in place. As soon as the story broke, the internet blew up. It didn’t take long for other bloggers to dig up tidbits relating to Deadspin’s story. One of the first links I saw was a post from @TheBigLead. It contained video of a Te’o post-game interview where he references his deceased “girlfriend” and how she was the inspiration behind his play. It was really creepy to see. Everything described above happened from about the time I left work on Wednesday to the time I arrived home. My wife and daughter were out of town visiting family, so the minute I got home, I went straight to a computer. I became obsessed with this story. While Deadspin’s piece was fascinating and showed a few of the Twitter interactions between Te’o and Lennay Kekua, I wanted to see them all. So I went through Teo’s Twitter timeline and extracted every tweet he sent to the three accounts that Deadspin pinned as ones belonging to Kekua. His tweets were sloppy and extremely difficult to read, so it was hard for me to understand how interactions like these could lead to love. It was clear that these tweets were only a fraction of the bigger picture. It was around 8:00pm Wednesday that I saw a tweet from @McMurphyESPN that said Notre Dame planned on holding a press conference in response to the Deadspin story. I, like many others, was shocked by this. The fact that the University would swoop in so quickly and hold a press conference was baffling. Athletic Director Jack Swarbrick fielded a barrage of questions surrounding the hoax, and actually gave a surprising amount of detail. One particular detail, in my opinion, led to the undoing of Te’o as the public awaited more details. 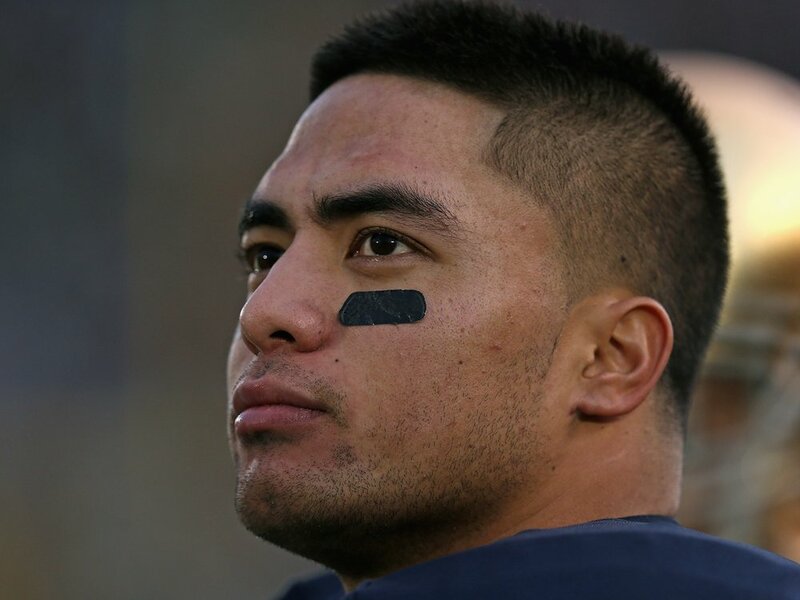 Swarbrick said that on December 6th, Te’o received a phone call from a person with the same voice as that of Lennay Kekua, his girlfriend that he thought had died. We all assumed this was when Te’o first learned of the hoax. The AP reported at least two instances after that date in which Te’o, with supposed knowledge of the hoax, spoke in public about his deceased girlfriend. Without that little detail, it would have been difficult for the public to view Te’o as a liar, given the murkiness of the other evidence at the time. But the timeline proves that Te’o was deceptive, at least on the back end. Whether it was out of embarrassment of revealing his online relationship or him being in on the hoax to boost his Heisman campaign, he lied. That didn’t sit well with many. At around midnight on Wednesday, follower @knicksinseven alerted me to the Twitter feed of a user named @justinrmegahan. I checked out his feed, and I was stunned. Below are his tweets. The last two are services that basically scrap twitter for content. Even if accounts deleted content can still exist on other sites. Justin’s findings spread like WILDFIRE across Twitter. I remember when I first looked at his profile, he had a few hundred followers. He now has almost 6,000. Heavy hitters on Twitter such as @bomani_jones, @richarddeitsch, and @SarahSpain were directing their followers to Justin’s timeline. His findings were getting hundreds of RTs. I honestly have no clue how he found these tweets, because by the time he must have conducted his search, the Te’o story had been out for hours and there must have been tens (if not hundreds?) of thousands of tweets on the subject already out there. I, too, tweeted out Justin’s findings, and Tim Burke, the co-author of the ground-breaking Deadspin post, quickly chimed in. @bubbaprog @justinrmegahan It was? I must have missed it. Not many put two and two together that these tweets dug up by Justin were tweets that were likely a key component in Deadspin’s probe into the user behind the fake Kekua accounts. The tweets were never specifically linked in their story, but were certainly alluded to. Justin just happened to cause a late-night stir by chance. A morning tweet by @YahooForde also caused havoc. Forde reported that Te’o was slated for an interview with ESPN’s Jeremy Schaap sometime that day. I was shocked that Te’o would speak out so soon, especially given that Deadspin hadn’t yet published a follow-up to their first story. Te’o didn’t know what else Deadspin knew, so this was a very risky move. Later in the day, it was announced that the interview was off. As the morning went on, a few more interesting links popped up. A Notre Dame student gave his perspective on the story, including talk around campus and in the locker room that many suspected something was off with Te’o’s relationship with Kekua. A Poynter interview with Tim Burke gave an interesting viewpoint from Deadspin’s side, including how they were tipped off to the story. Burke also discussed the story on the Dan Patrick show. A little after lunchtime on Thursday came the next big bombshell in the Te’o story: a report from TMZ that gave some chilling details of the background of Ronaiah Tuiasosopo, the man who Deadspin alleged was behind the hoax. Later Thursday evening, another bombshell hit. This time, it was an unedited transcript released by Sports Illustrated’s Pete Thamel. Thamel was widely criticized for his reporting (or lack thereof) in a story he did on Te’o which appeared in the Oct. 1 issue of SI. In the interview, Thamel asked Te’o a host of questions about Lennay. Te’o’s responses, while sometimes vague, were ones that only raised red flags, in my mind, with the benefit of hindsight. Much of Thamel’s critizicsm came because there didn’t appear to be much of an effort to verify the information provided on Lennay, especially her death. Even without finding details of her death, an obituary, or even a funeral, Thamel pushed out the story in the tight 2-hour deadline he was given. After taking a lot of heat once Deadspin’s story came out, SI published a full transcript of Thamel’s interview with Te’o. The unedited transcript gave readers a shocking look into how deep this hoax actually went. In addition to the original Deadspin story, I would mark this transcript as another absolute must-read. In the wake of the Te’o story, two people I follow closely on Twitter felt compelled to come forward and share their own personal experiences of being “catfished” by a stranger on the internet. The first story comes from @thefootballgirl. I was stunned after reading it. The second catfish confession came from @mtRoth29. A pitcher at South Carolina at the time, his story showed some striking similarities to the Te’o story. The next morning, I listened to a radio interview with Te’o’s uncle. It’s a long one, but absolutely worth your time. Te’o’s uncle describes the time he first met Ronaiah Tuiasosopo, and he smelled a rat from the beginning. He believed that Tuiasosopo was trying to get close to Te’o in an attempt to possibly extort money from him. He backed Te’o 100%, and after hearing the interview, I believed him. Another groundbreaking story from @ShelleyESPN popped up Friday afternoon. In her report, a friend of Tuiasosopo came forward to ESPN and claimed that Tuiasosopo called her, in tears, and confessed to concocting the Te’o hoax. Also included in the story was a report from two people whose cousins were also duped by Tuiasosopo in a separate but similar scheme. Word broke late Friday afternoon that ESPN’s Jeremy Schaap finally landed an interview with Te’o. A photo from the interview was tweeted by ESPN PR Friday evening. While the world waited for details from Schaap’s interview, a story from USA Today was published which gave more background into the life of Ronaiah Tuiasosopo. The story gives three chilling facts from Tuiasosopo’s real life that mirror the Kekua persona he portrayed in the Te’o hoax. Finally, late Friday night, details that we had all been waiting for finally emerged. ESPN’s Jeremy Schaap went live on SportsCenter to discuss his reactions after his 2.5-hour interview with Te’o. Video of Schaap’s impressions, as well as the story, can be found here. In the interview, Te’o said that he was not involved in perpetrating the hoax in any way. He also said that he was never 100% certain that the whole thing was a hoax until two days prior, when Tuiasosopo called him, confessed, and apologized. Deadspin posted a recap of Schaap’s interview early Saturday morning. I’ll be updating this post as new information surfaces. Did I miss anything? If so, let me know, and I’ll work it into the timeline. Did @justinrmegahan just get one step closer to cracking the Manti Te’o case? So I went through Manti Te’o’s Twitter feed and found every tweet that he sent to his “girlfriend”. According to the smoking hot Deadspin story, Manti’s fake girlfriend used the account @lovalovaloveYOU from 2011 to April 2012, @LennayKay from April to September 2012, and @LoveMSMK ever since. Te’o doesn’t have too many tweets, so it wasn’t that difficult of an exercise. I’m actually shocked that he hasn’t deactivated his account. I wanted to get this up ASAP before all the tweets were gone. All I did was go to allmytweets.net, searched his name to pull up every single one of his tweets, then did a CTRL + F on all three Twitter accounts. I copy/pasted the embed codes and have embedded them below. He may or may not have been in the process of deleting them as I was going through this, because tweets to @LoveMSMK are nowhere to be found (the account has been deactivated). I would still think tweets from Te’o to that account would still be visible, though. Odd. Below are the tweets, from oldest to most recent. Twenty tweets to @lovalovaloveYOU, twenty to @LennayKay. This is a snapshot of Te’o’s “relationship” with this person. Does it look authentic to you? shout out to my girl @lovalovaloveyou . tweeps I need to get her some followers. “@lovalovaloveyou: #20songsiloveFiji. The Vow. .”*ahem…and so is this one. Happy birthday to my girl and best friend @lovalovaloveyou have a great 22nd birthday grumpy! @lennaykay Without struggle there can be no gain! Without pain there can be no growth! without sorrow there can be no joy! I’m proud of u!! @lennaykay Be strong. Be brave. Never give up. Love u. Me: “you just shot that idea down with a shotgun”@lennaykay : “no I shot it down with a bazooka so it will stay down!” lol love this girl! @lennaykay @kcvas sole just tell her don’t explain it! “@robjob293: @lennaykay @mteo_5 cuz u guys are both BURGAHHHZZZZ lol” sole I was Killin in chess!